The British-developed Ambisonic surround-sound system is not the only technique capable of producing a 'surround' effect in use today - modern developments in SQ technology have found application in the film and video fields. However, Ambisonics is capable of excellent results, although until recently there has been little available in the way of mixdown equipment to make mass-market multitrack-derived record releases possible, and this has restricted the appeal of the system (although there are currently over 150 albums recorded Ambisonically with the Calrec Soundfield microphone and similar systems) and this has held back the sale of decoders. All that is about to change, however: a new range of equipment designed by Dr Geoff Barton of the Ambisonic Technology Centre in Reading, and manufactured by Audio and Design Recording is about to be released. The prototypes of these devices have been installed In a studio at nearby Cruchfield Manor in Berkshire, making this the world's first Ambisonic recording facility with multitrack capabilities. Richard Elen often uses the studio and has been evaluating the equipment with the help of Geoff Barton, and offers some observations and techniques which should be useful in developing Ambisonic mixing for both the surround-sound and stereo environments. 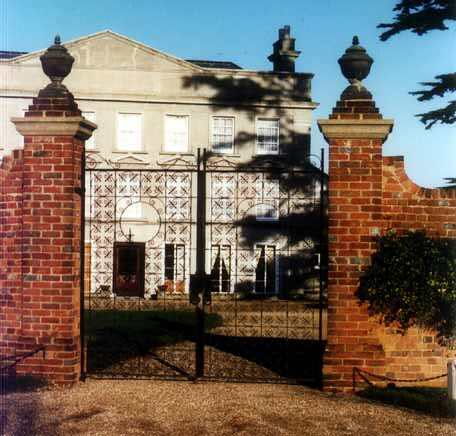 Cruchfield Manor is situated on the A330 between Ascot and Maidenhead in Berkshire, a few miles from Bracknell, and is an impressive building once owned by the Cadburys. Adjacent to the Manor is a small building, once the blacksmith's forge for the stables next door, which the present owner, composer/arranger and musician Keith Mansfield, chiefly known for his successful KPM Music Library albums, has converted into a 24-track studio which is jointly owned by him and top recording engineer John Timperley. Principal recording equipment consists of Soundcraft 2400 24/24 console and 24-track recorder, and Studer B67 stereo machine. Now that the equipment exists to produce Ambisonic mixdowns from multitrack and the fact that the Ambisonic Technology Centre is 'down the road' (10 miles away in Reading) made Cruchfield an ideal location for experiments with the new prototypes. The primary requirement for mixing multitrack material into Ambisonics is that the tracks on tape can be localised individually into their required positions in the soundfield image. This requires, quite simply, the Ambisonic analogue of the common panpot. The simplest way of achieving this is to build a unit based around a 360-degree potentiometer with a sine/cosine law, allowing one to localise a signal source within the soundfield and giving a B-Format output. B-Format is the standard format for Ambisonic signals: it consists of four signals in its complete form, these being labelled X W, Y and Z, where W is effectively mono, X represents front-back, Y left-right and Z up-down. As we are only considering horizontal surround sound (without height information as in full 'periphony') in this instance, we can dispense with the Z signal, although the circuitry is easily modified to cope with it. The present prototype 'pan-rotate' unit is a IU rack-mount device with eight continuously-rotatable sin/cos panpots plus a 'rotate' control which can be used to rotate the entire soundfield continuously through 360 degrees. The panpots can be switched to come before or after the rotate control and there are two external B-Format inputs - one pre-rotate and one post - which may be used to chain these or similar modules together. The rotate control may also be switched out altogether. The single B-Format output may be taken to a 4-track recorder, or to an encoder to produce a UHJ 2-channel-encoded master tape which can be cut to disc or broadcast in the usual way. Unfortunately, sin/cos pots are very expensive, and in addition the pan-rotate unit requires individual mono inputs to be fed from the desk - this could make the console patchfield rather a mess - so other methods of localisation had to be found. One such is the 'B-Format converter' unit, which enables the console panpots to be used for localisation, thus freeing the pan-rotate unit for dynamic panning effects, or where a higher degree of localisation control is required. The production versions of the pan-rotate unit will be 2U high and will include a 'radius vector' control for each panpot. These controls are used with the panpots to determine the distance of the source from the centre of the image, so the angle can be set with the panpot and the apparent distance away can be adjusted with the radius vector control, which is a 270-degree pot with a switch at the end of the track, varying the distance from 'normal' (switch position), corresponding to the periphery of the field, through 'zero' (centre) to 'minus', thereby allowing panning across a diameter of the soundfield. The two controls can be used together, of course, to produce 'spiralling' effects between the periphery of the field and the centre. The converter unit is another 1 U rack-mount device with no controls at all other than a power switch. Inside are two independent B-Format groups with separate ouputs, each group having five inputs. These are designated LF, RF, RB, LB and ES and are designed to be fed from four console groups plus an echo send (postfader). The echo send level supplies the W (mono) reference while the console group inputs provide level information which is 'converted', with the W signal, into B-Format. Thus any console panpot can be used as an Ambisonic localisation control merely by turning up the echo send level (which must be the same level as the main channel output at any fader position) and routing to two of the four groups. The converter unit assumes two things about the console: first, that you can pan between odd and even groups and second, that its panpots have a 'constant power' characteristic. This latter gives you a signal level 3 dB down in the centre in stereo, and is quite a common panpot characteristic (more on this subject later). Fig 1 shows the way in which the console panpots are used. If we assume that the four groups are 1, 2, 3 and 4, then selecting 1 and 2 allows panning across the front quadrant (LF to RF); selecting 2 and 3 pans across the right quadrant (RF to RB) and so on. The converter unit is thus ideally suited to the task of localising most of the channels in B-Format, especially those which do not need the dynamic effect capability of the pan-rotate unit. And the fact that there are two such B-Format groups, both entirely separate, adds to the flexibility of the unit. There is a further unit which has localisation applications too, the Transcoder. This was one of the first Ambisonic units produced for mixing applications, and the original prototype which we used for mixes at the 1981 Cunard Hi-Fi show [where the Boots Audio Ambisonic system was demonstrated - RE] was based on the UHJ 2-channel encoder made by Calrec to accompany the Soundfield microphone. In essence, it takes four inputs which may correspond to the four corners of a 'quad' setup (generally four groups again) and 'transcodes' them into a 2-channel UHJ-encoded signal. Having covered the units used for Ambisonic localisation - all of which were designed to allow a conventional stereo multitrack desk to be used for Ambisonic mixdown - we now come to one of the vital parts of the system: decoding, and monitoring the result. A number of Ambisonic decoders are currently available from any one of half-a-dozen manufacturers, although you won't find many in the shops - yet. The speaker feeds were sent to a pair of HH V-200 MOSFET amps driving four Keesonic Cubs mounted on mic stand bases, enabling their height to be adjusted easily. Keesonic kindly supplied two extra Cubs [to go with John Timperley's existing pair - RE] with threaded baseplates to fit standard mic stands. There is no disadvantage in using small speakers for Ambisonics, as long as they are not too directional, particularly at HF. The first part of the setup procedure was to position the speakers in sensible places. The easiest way of doing this is to find a practical rectangular layout in the control room, position the speakers to point at the listening position (which is rather less critical than for stereo, although careful pointing of the speakers is more necessary if the HF dispersion is limited) and then measure the sides of the rectangle and set the layout control on the decoder accordingly. It is misleading to try to adjust the layout control by ear, especially if you are new to the system. The speaker height should be adjusted to normal monitoring criteria, with the proviso that it is helpful not to have them too high, to avoid the image forming slightly disconcertingly over your head! But then again, the same is true with normal stereo monitoring. The decoder controls are then adjusted accordingly. We checked the layout with a 2-channel UHJ 'walkround' test recorded with a prototype Ambisonic panpot in 1981. There is also a 'walkround' band on the current Hi-Fi Sound test record, made with a Soundfield mic. These tests simply consist of a voice calling out cardinal points around the sound field: North (centre front), East (centre right) and so on, plus the points in between. The cardinal points are in many ways more useful than the old-style 'quad' labels LF, RF, etc, as often the speakers will not be 90 degrees apart, and unlike 'quad', there is no 'pulling' of the image into the speakers. Thus 'North West' might not be near a speaker at all, but it will be 45 degrees left of centre front, if all is well. Minor compensations can then be made with the layout control if needed. In our case, we derived the 2-channel send for the UHJ input of the decoder from the 'alternate control-room monitor' outputs of the Soundcraft 2400, and here we had our first taste of a problem which kept on cropping up during the setup procedure. It is a problem that has nothing to do with Ambisonics - it is simply that Soundcraft, aiming for the US as well as the domestic market, have decided to wire their XLR connectors with pin 3 hot. All our gear, of course, right down to the HH power amps, is wired with pin 2 hot. This means that precisely nothing came out when we first tried the monitoring, and later the Transcoder. A few minutes work with the soldering iron perverted a few XLR leads to phase-reverse mode but the whole exercise was a pain. Having sorted it out, we were left with an Ambisonic monitoring system which could be switched out without disconnecting anything. As John Timperley uses the Keesonics as secondary monitoring anyway, this was an essential consideration - indeed one that was designed into the whole 'Ambisonic Mastering System' - one should be able to use the studio setup for ordinary stereo with the minimum of effort and complexity. We next decided to set up the Transcoder. This has XLRs in and out, including the B-Format input which uses a 5-pin XLR wired to an agreed standard. All the Ambisonic units to date are unbalanced, and here again we were expecting conflicts with the XLR pinouts - and got them. Luckily the ADR Transcoder has links on the PCB to allow for curious XLR wiring 'standards' - as will production units of the other devices - you simply remove the top cover and replug the links. Through all our experiments, this XLR perversity was our only problem. It took several minutes to sort it out every time it occurred. The Transcoder was provided with XLR-to-Bantam leads which enabled us to patch it into the comprehensive patchfield on the 2400, for test purposes deriving the inputs from group insert sends 1 to 4, thus bypassing the group faders to ensure the same levels from each group. The 2-channel UHJ output was patched into the mix bus insert returns, to enable the main mix fader to be used to control the overall level of the UHJ-encoded signal to tape. An experimental mix was performed, which immediately indicated that the ADR production Transcoder was more accurate and flexible than the original prototype we had used back in 1981. A couple of weeks later we tackled the interfacing of the converter and pan-rotate units, having used the intervening period to order up bantam to 1/4 in jack leads from Future Film Developments. These were brought down together with some 5-pin XLR leads to interconnect the various B-Format outputs and inputs. We used a speech signal from the radio as source, patched into a console channel for testing (speech is very useful for checking localisation as it contains a narrow range of frequencies; we also expect a voice to be coming from a particular direction). The post-fade line out from the channel was routed into the pan-rotate unit's number 1 panpot, with the rotate control switched out, the B-Format output from the unit being patched directly into the B-Format input of the decoder for test monitoring purposes. We were immediately struck by the accuracy of localisation offered by the pan-rotate controls, and by the fact that localisation in B-Format is somewhat superior to that achieved via 2-channel UHJ. The controls proved easy to use, and the ability to send a sound right round the room with one control was fascinating, although some engineers might find 360-degree rotation on one 360-degree pot a little coarse compared with the conventional panpot, which offers approximately 60-degree localisation with a 270-degree control. This soon becomes natural, however, and the highly-accurate one-to-one correspondence of knob position to sound position is very satisfying. We then experimented with the rotate control, using it to rotate an entire soundfield derived from several panned channels through 360 degrees. Rotating the entire soundfield is quite remarkably disconcerting, although this isn't something one would normally want to do. Rotating certain elements within the soundfield is more subtle and useful. It is amazingly easy to spot localisation faults caused by incorrect wiring. The first B-Format lead had a fault in it: the Y signal line had come adrift in one of the plugs. This caused a rotated signal to move from back to front rather than round the circle, and was easy to spot as an error condition. The fact that there was no localisation to left or right immediately pointed to the Y signal being missing, which was found to be the case. This having been rectified, we next tackled the converter unit. We expected problems with the converter unit, as it is designed to take an auxiliary postfade cue send as its W source, which must be the same level as the feed to the groups. In addition, the unit is designed to work with constant-power panpots, as stated earlier. Soundcraft consoles do not use constant-power panpots. They use instead a compromise between constant voltage (6 dB down at the centre in stereo, whicb gives a good, wide image) and constant-power (3 dB down at centre, giving good stereo/ mono compatibility). This results in a law which gives about 4.2 dB down at the centre in stereo. It is quite easy to modify these panpots to constant-power, you simply add resistors across the existing ones in the wiper of each gang of the pot, the added resistor being of the same value (3.3 k ohms) as the existing ones. However, I did not relish the thought of persuading John that it was a good idea to add dozens of extra resistors all over his console! So we decided to try it without console modification to see what happened. Neither did we measure the aux output to determine at what level we obtained the same level as from the main output. We just plugged in. Setting a panpot to hard right, we patched the first group of the converter lines into group insert sends on groups 5 to 8, and derived the ES line from the Aux 1 output on the patchfield, turning the Aux 1 send on the channel to full and the Aux 1 master level control to 0. Routing the channel to groups 5 and 6 (to give panning across the front quadrant) we faded up the channel fader, again using speech as a test signal. A non-localised sound emerged which couldn't be said to have been situated anywhere. Turning up the Aux 1 master level, however, caused the sound to start 'gathering itself together' at the North-East edge of the sound field. With the Aux send level at 6 (on a scale to 0 to 10), the signal was accurately localised in the NE corner, exactly as it should have been with the desk panpot in the far right position. This position, incidentally, was nowhere near the speaker: we had a rectangular layout slightly wider than it was long, and the sound in this instance was at an accurate 45 degrees to the listening position, rather to the left of the RF speaker and a good few feet beyond it! We had already noted with the pan-rotate box that the sound field extended some way beyond the limits of the speaker layout. Turning the Aux pot beyond 6 and towards 10 tended to drag the localisation into the toom and towards centre- front. Rotating this control up and down produced a well-defined point (setting 6) at which the sound was accurately localised in the desired position. On checking this later, we found that indeed, this position corresponded to zero level with respect to the main output. Then came the bigger test, which was to evaluate the law of the desk panpot operating Ambisonically via the converter box. Panning from right to left, we perceived a very smooth panning law, with the pot covering the front quadrant with a great deal of accuracy, and no discernible changes in level across the quadrant. Thus we did not have to modify the console: neither should mods be needed on consoles which have this kind of panning law compromise, which includes a good number of consoles currently available. Some consoles with constant-voltage panpots have a 'compatibility' button which switches the panning law to constant-power, and these present no problems either if the 'compat' button is pressed. We do not yet know what the effect would be of using a constant-voltage panpot through the converter, but we would expect a non-linearity of the panning law and slight changes of level across the quadrant, plus changes in the precision and quality of localisation. As it was, however, the Soundcraft panpots exhibited a very smooth localisation action which was comparable to that experienced in normal stereo. Panning across the other quadrants was equally impressive, one disconcerting (and unavoidable, unless you can pan between any pair of groups) factor being that panning over the side quadrants, the panpot is moving in the opposite direction to the sound! Farniliarity with this slight idiosyncrasy comes pretty rapidly, though. Having ascertained that all the units were operating correctly, we set up the console for a mixdown. This was done in the normal way, but with the Ambisonic units set up as shown in Fig 2. Thus the 'A' group of the converter box was fed into the post-rotate input of the pan-rotate unit, deriving its feeds from console groups 5 through 8 and Aux 1; the B group of the converter was patched into the pre-rotate B-Format input of the pan-rotate unit, with its signals derived from console groups 9 through 12 and Aux 2 (although this was not used in fact). The eight pan-rotate inputs were patched direct into channel line outputs as and when required later in the mix, and the B-Format output of the pan-rotate unit was fed into the B-Format input of the Transcoder - this simply encodes it into 2-channel UHJ. The fact that our Soundcraft only had 24 input channels led us to some rather unusual wiring when it came to echo returns. We wanted to use the converter box for primary localisation, the pan-rotate unit for dynamic panning and rotate effects, and the Transcoder to return two reverb units - a MicMix spring system and an EMT Gold Foil - to the UHJ master output, spreading the EMT over the front stage and MicMix across the rear, fed from Aux 5 and 6 respectively. Normally we would have patched the echo returns into the monitor panel inputs, which return to the aux bus and whose faders can be 'swapped' with the group fader (which are full-length as opposed to the monitor faders, which are small). However, in this configuration, the mix bus was to carry the 24 channel UHJ-encoded master signal, rather than straight stereo, so we couldn't return to there! Instead, we patched the first four group outputs into the Transcoder, returning the reverb units into the group insert returns on those groups. This enabled us to use the large group faders to control the echo return levels. We could adjust the spread of the reverb returns in the sound field with the width controls on the Transcoder (which affect only the signals applied to the four transcode inputs, and not the B-Format input which is merely being encoded and mixed at unity gain with the UHJ from the transcode inputs to provide the main output from the unit). This enabled us to spread the EMT across up to 180 degrees at the front and the MicMix across up to 150 degrees at the rear. We had previously discovered, in our 1981 experiments - the first ever Ambisonic mixes derived from multitrack - that two reverb returns spread across front and rear stages like this is very effective: while only mono sends from the channels are used, you can send echo from a given channel and have it return either in the same sector as the source or in the opposite sector, just as it is sometimes useful in stereo to have a signal on the left with its echo on the right, for example. The UHJ 2-channel mix output from the Transcoder was then patched into the mix bus insert return to allow the master fader to be used as before, and the mix was sent to the stereo master recorder in the usual way. This had the added advantage - as the decoder was patched out of the alternate monitor outputs - of allowing easy replay of encoded tapes, just by pressing the stereo replay buttons; plus the capability to select bypass on the decoder to check stereo and mono compatibility as well as being able to switch in the main monitors instead - with a single button - and hear the UHJ signal in 'stereo' or 'mono' on the main system. This proved to be very useful, and again fulfilled one of the design goals of the system, that of ensuring that the setup could be returned to normal stereo use with as little replugging as possible - in this case, it was simply a matter of pressing either bypass on the decoder, or the speaker select button on the board, to return to stereo monitoring. The Ambisonic boxes were placed on a table next to the console, where the 24 track remote is positioned, for easy access to the controls. This is shortly to be replaced by a rack cabinet which will enable all the Ambisonic boxes plus the extra monitoring amps to be neatly installed, and still leave room on top for the 24-track remote at a reasonable height! Almost immediately a number of mixing techniques were evolved to make best use of the system. One of the great strengths of Ambisonics is that there is a very high degree of compatibility between UHJ, stereo and mono. Indeed, we feel that the compatibility in these respects exceeds that of stereo. When an Ambisonic signal is 'collapsed' into stereo - simply by replaying a 2-channel UHJ signal into two monitors with no decoder, for example - the 'rear' images are simply projected on to the front, so that they are perceived at the same distance to the side of the stereo sound-stage as they are in surround. Thus a sound positioned, say, 'South-South-West' in surround will end up half-left in stereo. Also, a signal rotating continuously round the field in surround will simply pan from left to right and back again in stereo. Additionally, a UHJ signal replayed in stereo has a number of interesting characteristics. First, as Ambisonics uses phase and level to localise a source, rather than simply level as we are used to with conventional stereo panpots, the image is much less dependent - either in stereo or surround - of listener position, very much like a coincident-pair recording (indeed, Ambisonics is very much like a 'three-dimensional coincident pair', and this is exactly what the Soundfield mic is). This means that you can wander about in the listening environment without losing the image. It also means that producer and engineer, for example, will hear the same thing. In stereo, as well as surround, the image is more stable, and sources can be more 'tightly' localised. For some reason yet to be properly explained, the width of a UHJ recording played in stereo on loudspeakers is wider than the speakers, and stereo effects can be produced which go round the room without having the benefit of an Ambisonic decode system! On headphones the effect is even more pronounced: instead of the usual 'line between the ears' of conventional panpotted stereo, some kind of 'brain decoding' produces the illusion of a sound field, albeit less deep (front to back) than Ambisonic speaker-decode. All this means that stereo-mono compatibility is built into the Ambisonic system: indeed it is more compatible - and more flexible - than ordinary panpotted stereo. And those exciting effects will cut on an analogue disc with no trouble, too, unless they are really loud and bassy - which means situation normal as compared with conventional stereo. As much Ambisonic material will be played back on conventional stereo systems (they may even be mixed specifically for stereo applications!) initially, this compatibility must be borne in mind. There are no technical problems with compatibility, as has been discussed above; but there are also creative considerations if the mix is to sound good in stereo. For example, newcomers to Ambisonics may find it very tempting to localise sources in places where you could never go in stereo - round the back and sides. It must be remembered that for the stereo listener, these will be 'collapsed' on to the front, and careful positioning is necessary ( and easily practicable) to avoid cluttering of the stereo image. Impressive sounds which spread right across the soundstage from East to West sound very good Ambisonically, and you may like to put several stereo signals across from E to W - but in stereo they will all be split left and right (albeit somewhat beyond the speakers). Impressive front-back stereo splits will end up in mono when replayed conventionally, and this should also be borne in mind. This means that care should be taken in what signals get positioned where. Use the all-round positioning that Ambisonics offers by all means, but bear in mind what the relationships will be in stereo. Just as you choose what to locate near or far from centre in stereo, choose in similar manner when mixing with Ambisonics. Here the ability to check stereo easily (or mono) at the push of a button proves itself. We found rapidly that the best approach when balancing for Ambisonic/stereo compatibility was to localise sounds in decode mode first via the Transcoder or B-Format converter unit, later choosing which channels were to go to the pan-rotate unit, checking them in stereo on the small speakers (which will give a better image) as and when needed, and then switching to the main monitors to get sounds and EQ (because, in stereo, little speakers are little again) and to obtain the right stereo balance. You will find, as we did, that a mix balanced in this way - that sounds great in stereo - will also sound excellent through the decoder in surround. Consider especially - if your are using dual reverb systems like we were - the relationship between a source and its reverberation in surround. Here reverbs like the Quantec and the Lexicon - which have four outputs and two inputs - really come into their own. The Quantec especially, with the capability to add early reflections to the first two channels (these should be wrapped across the front stage of the Transcoder) is exceptionally effective, and the Lexicon can of course be split to offer two stereo-out/mono-in systems with differing characterics. Of course, on some material, all the sources will sound best localised around the front of the sound field, with only reverb/ambience at the rear - this is obviously no problem. While rock music sounds impressive coming from all points of the compass, multitrack-derived orchestral material would sound a bit unusual performed in this way, with the listener in the middle of the orchestra! On such material, it is useful to have recorded a set of ambience tracks in B-Format on the multitrack from a Soundfield mic if you have one, although a stereo pair or two could be routed via the Transcoder if desired, along with the reverberation returns. If you have effects returns with routing, or spare channels for them, it is best to allocate four groups to the Transcoder inputs and route the returns and effects to them, bearing in mind that you can position returns with the ordinary panpots anywhere between the extremes of the two soundstages available with the Transcoder. They can also be routed via the converter box groups in a more flexible way, and if channels are available with normal routing for effects and reverb returns, localising them in this way may prove more useful. The idea of the soundstages on the Transcoder does, however, give a useful impression with returns from reverberation devices, although of course it cannot be used if a B-Format master is required. Generally speaking, it is preferable to mix Ambisonically to B-Format, and store the master on 4-track tape. It can then be encoded later through an encoder or via the B-Format Transcoder input for conventional 2-channel purposes, and 2-channel UHJ is the current conventional 'release format' for Ambisonic recordings whether for FM broadcast, conventional analogue record release, or Compact Disc. However, B-Format can later be encoded into other forms for transmission, for example '2 1/2' or 3-channel UHJ, which can be transmitted via FM radio by using phase-quadrature modulation for the third channel (which may be bandwidth-limited, hence the '2 1/2') as has been demonstrated by the IBA. Such a system is now permitted by the FCC in the USA. Equally B-Format can be used to derive future formats for Compact Disc - provision is made in the system for various types of extra information including 4-channel release, and subcoding could be used to switch a decoder automatically when a suitable record is played. Thus 2-channel UHJ is fine for now but B-Format will have applications in the future. In addition, one obvious application for Ambisonics will be in the audio-visual market: here it will be quite possible to use B-Format audio tapes on-site, played back via a decoder in the viewing area. Four channels of tape facilitate three channels of B-Format (assuming horizontal-surround only - hence no Z channel) plus one track for slide sync or even timecode. Ambisonic mixdown involves no techniques which are either difficult or time-consuming to learn. The existing units, which will be available shortly, are not expensive compared with modern outboard gear and add an impressive extra dimension in stereo, let alone surround-sound, to even averagely-equipped studio. With more console facilities, as available on many modern boards, even more flexibility is possible. VCA grouping, for example, would enable the various B-Format group levels to be adjusted easily with a single fader - for example, the two B-Format groups in the converter box could then be balanced independently and used for subgrouping, as could the group of signals feeding the Transcoder if it is in use. As it stands, all the Ambisonic units mix at unity gain, and thus need external control for group balancing. Of course, VCA groups can also be used normally, and this may be a preferable alternative, controlling the individual groups of faders on the console irrespective of which Ambisonic device they're feeding. While care needs to be taken in the setting up of the equipment, especially the decoder/monitoring section, this requires no more concern than usual in such areas. The system has the big advantage that returning to stereo is remarkably easy, whether during the course of an Ambisonic mix, or after the session when conventional stereo needs to be restored. All those who have heard or experimented with the system to date - including experienced musicians, engineers and producers - have commented on the remarkable compatibility of Ambisonics with stereo and mono, and the flexibility and ease of use of the system.